Sometimes it can be hard to keep one’s spirits high at this time of year. It all looks so sad and drab and the nights fall so quickly. 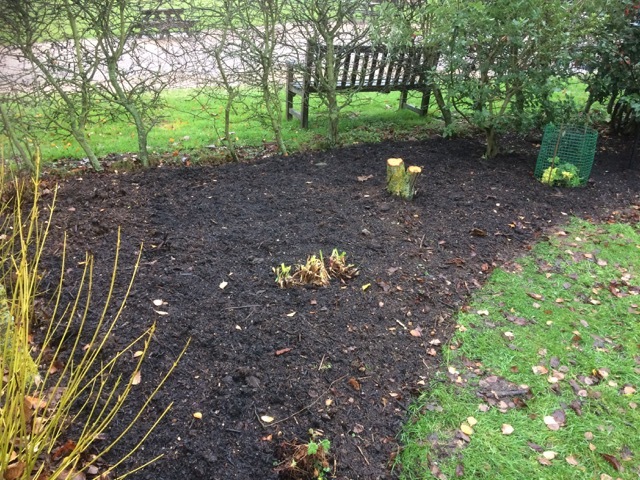 Every job we do seems to be a messy one and some days, when the wind is sharp and air damp, we really have to steal ourselves to make the extra effort that is always required of a winter gardener. Such an impressive sight in the gloom of a November morning is guaranteed to brighten the spirits. And, despite the cold, I saw a brave bumble bee taking advantage of this plentiful supply of nectar this week, reminding me that there are other busy workers around at this time of year too. 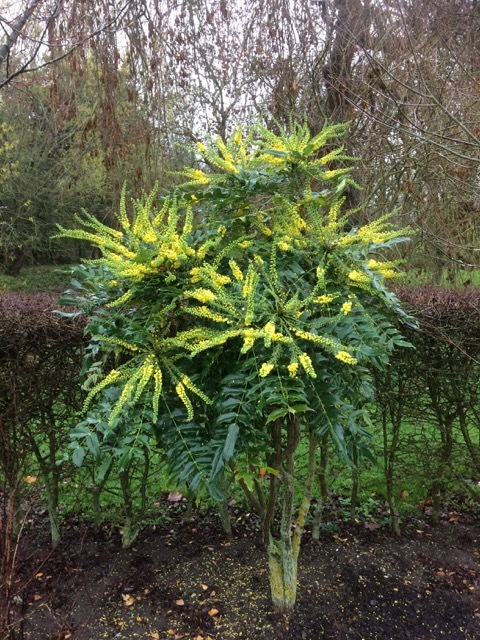 Mahonias are impressive winter shrubs, carrying flowers with a lily of the valley scent which last for many weeks. these are often followed by small plum coloured berries that are a useful food source for birds through the winter. Mahonias are close relatives of the Berberis, they are usually very hardy, unfussy about soil and are happy in the shade. What is not to like? Well, the spiky leaflets are hard to love I admit, but they are evergreen and shiny and set off the bright yellow flowers perfectly. 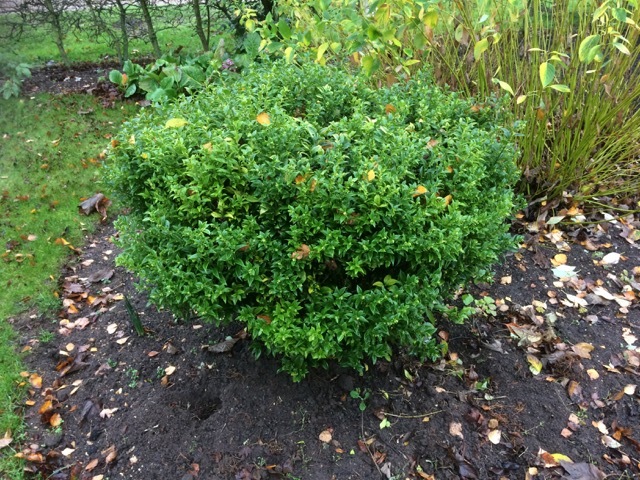 There are other valuable evergreens in the garden that come into their own at this time of year. 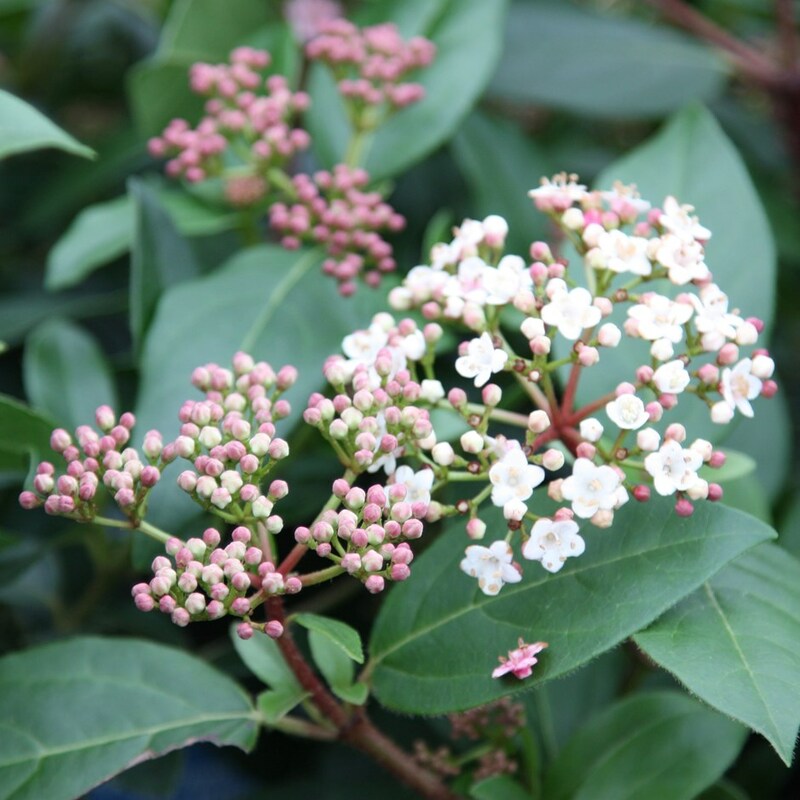 When choosing plants for our gardens it is sometimes very difficult to choose an evergreen over the seductive lure of all those colourful summer flowers winking at us from the plant table, but how silly we are to neglect the evergreens, the stalwarts of the garden in the winter season. 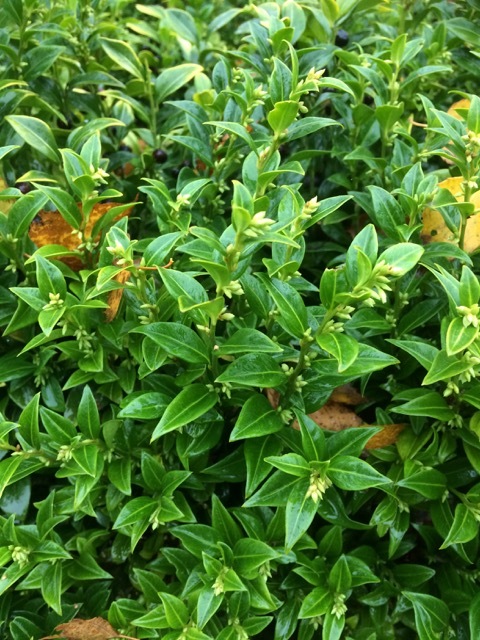 And here is one of my favourites: Sarcococca confusa. All right, I know it doesn’t look much but oh boy, you wait until you walk past it on a sunny winter’s morning and get hit by the most wonderful scent from the tiny but aroma packed flowers arranged all along the stems. Like the Mahonia, Sarcoccocas are easy, obliging plants and are fantastic in shade and poor soil at the base of taller shrubs or under trees. Make sure you don’t make the mistake of putting them at the bottom of the garden where you will probably never venture just when they are giving the best of their scented flowers. I grow them on the approach to our front door, giving us a cheery welcome when we leave or return home in January and February. But if aroma is not enough and you want winter flavour as well, then surely Rosemary has got to be the star winter evergreen. Who would buy dried rosemary when you can have your own ready supply all winter long by growing your own? 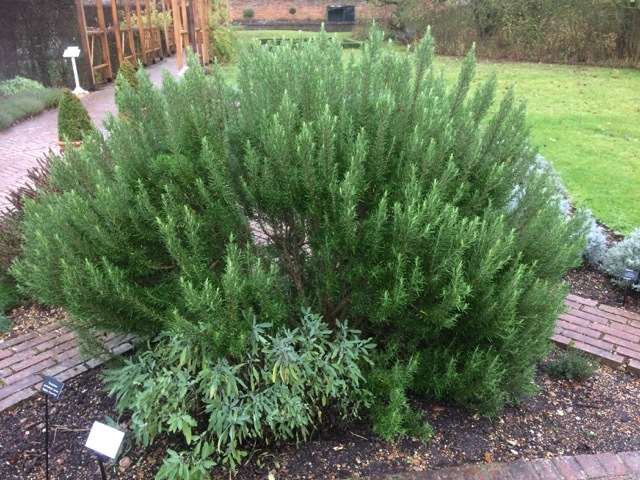 This one, the straightforward Rosmarinus officinalis which has grown to about 4ft in the walled garden might be too large for most of our modern gardens, but rosemary grows very well in a container and is easy to grow from cuttings, so you can always have a manageable sized plant ready to replace one that has got too big. 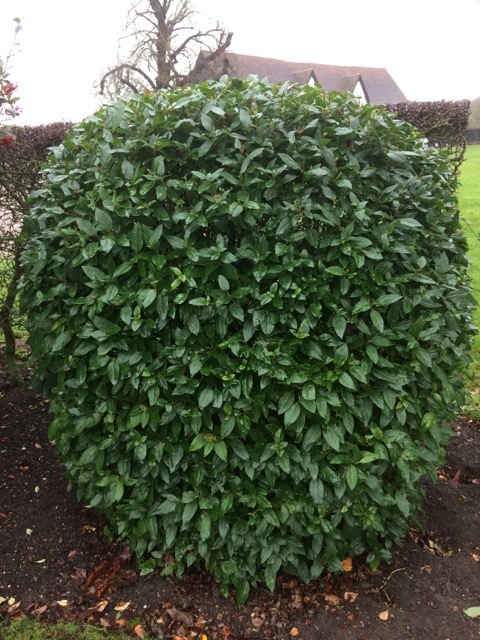 This next plant in my winter hall of fame might look like yet another boring green plant to you, and Viburnum tinus does have an unfortunate reputation as a ‘car park shrub’ or as the ubiquitous new build front garden specimen, but I think it looks rather good, carefully shaped in this way, looking healthy and glossy and very permanent. It is the kind of plant that gives me faith and confidence that it won’t be blown away by winter winds, reduced to a soggy lump by winter damp, or frozen to death by winter cold. And like so many evergreens, this one has a winter trick up its sleeve, in the form of rather pretty, pink clusters of flowers in late winter and the earliest part of spring. One of the best forms, and also the most commonly grown is ‘Eve Price,’ a real backbone of the winter garden. You may be getting the hint by now. I have precious few flowers to show you this month. 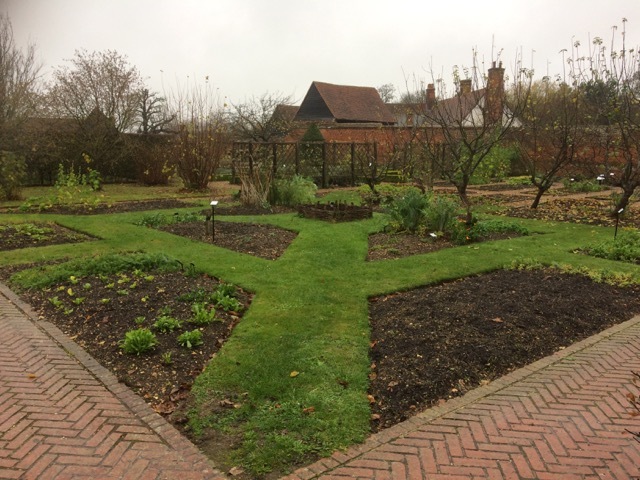 But the winter garden is all about structure and form, and as you can see from this picture of the forecourt garden, it can look appealing with not a flower in sight. 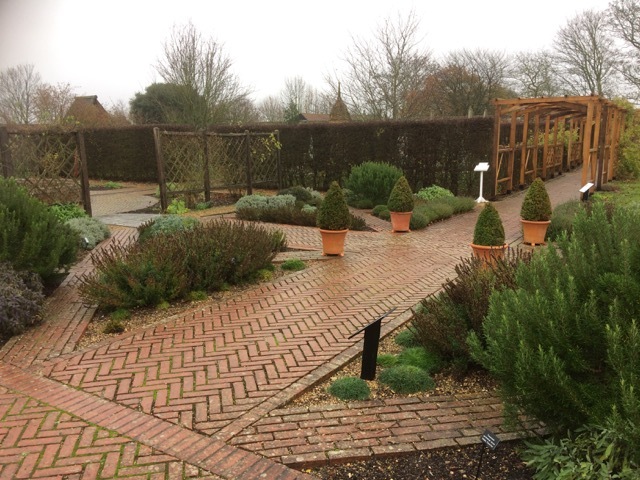 Most of the flowery plants in the walled garden are herbaceous and if we didn’t have these evergreens, how uninspiring it would look at this time of year. 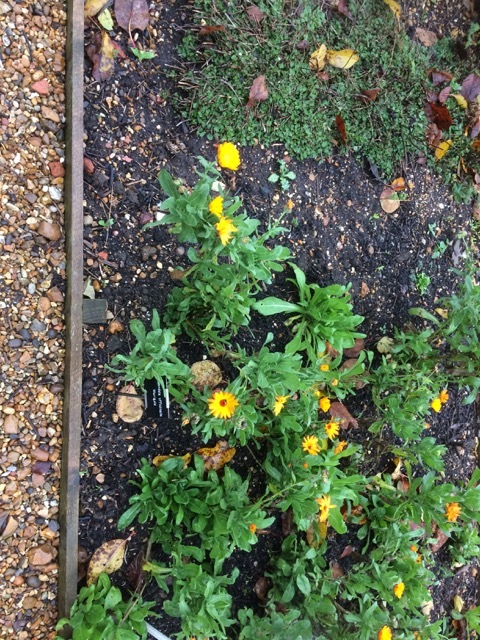 But there are a few flowering plants that simply refuse to give up, like this ever present and ever reliable marigold, Calendula officinalis. It might not have the same razzmatazz it had earlier in the year, but for sheer sticking power and relentless cheerfulness it has to get my vote. 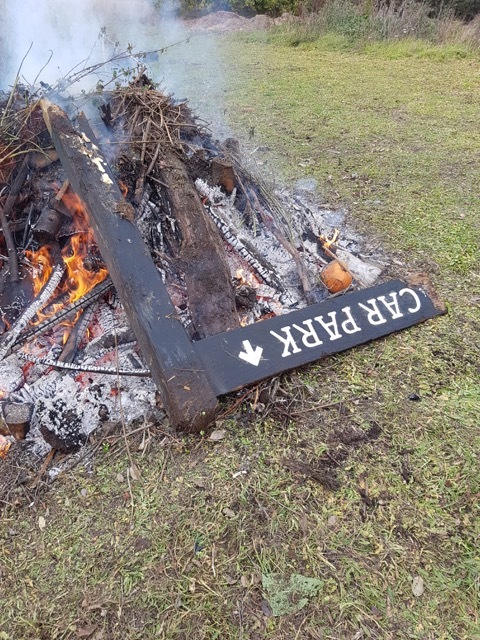 Not many people seem to celebrate bonfire night so much these days but we decided to do our bit with a bonfire day. We thought it might keep us warm, only to find it was about the warmest day of the winter so far and very soon we were all sweltering! 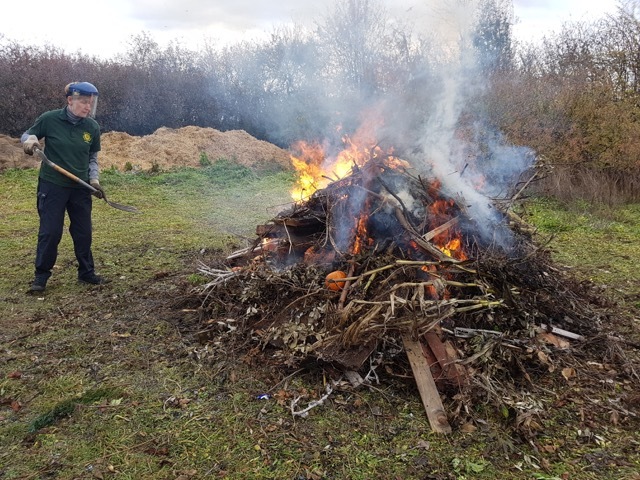 It was good fun as bonfires usually are, and had the added satisfaction of reducing the garden waste pile quite considerably. While some of us were getting hot and bothered over the bonfire, others were busy turning the last of our apple harvest into demijohns of potential cider. 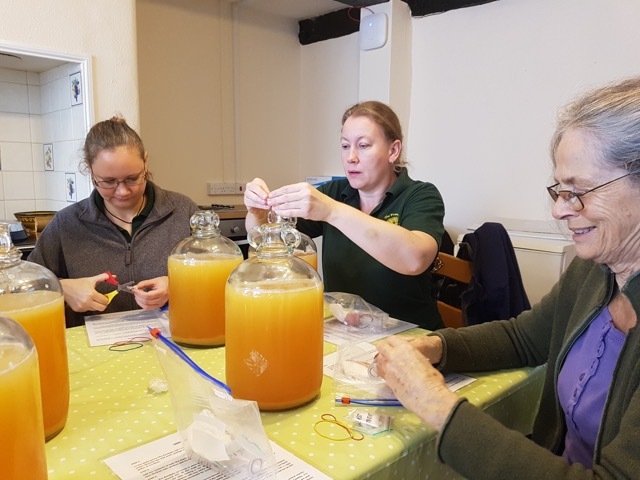 With expert instructions from Howard, each participant took home the beginnings of their Cressing home brew. We eagerly await the results and will let you know how the party goes! 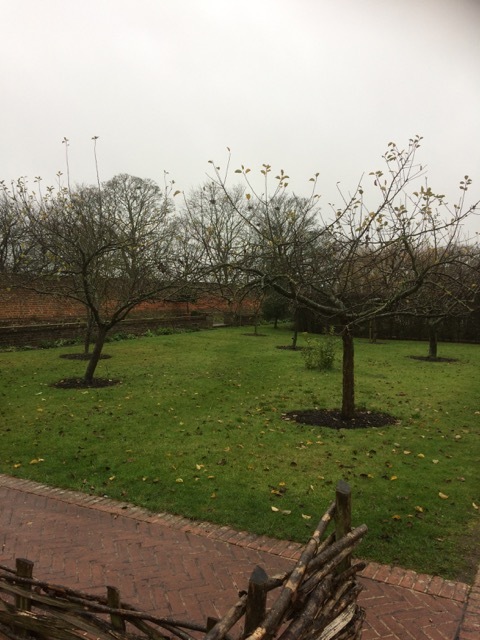 Recent jobs in the garden have included felling a small Prunus tree in the Cullen garden. It is always sad to see a tree go but this one had suffered a major split to the main trunk earlier this autumn, leaving a weak and mis-shapen tree that we decided was better taken down to make way for something better. In fact this corner of the Cullen garden had been rather optimistically planted, with several trees and shrubs in close proximity. An easy mistake to make at planting time but a situation leaving difficult decisions once they all become grown ups. 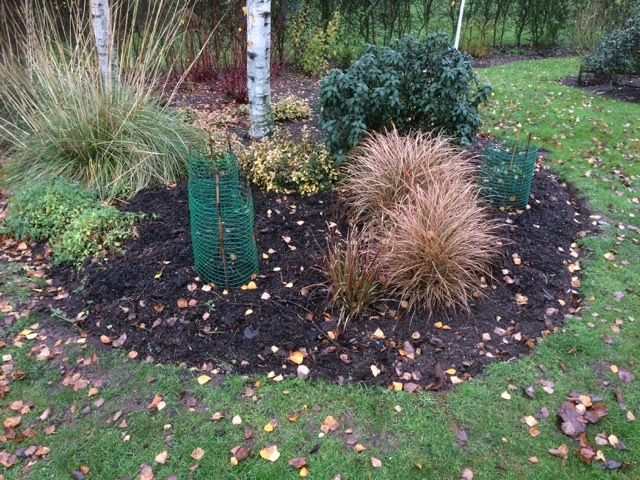 We have decided to replant this shady corner with tough, rabbit proof ground cover that can also provide a bit of colour, such as Bergenia and Geranium macrorrhizum with a more modest shrub for the back (another one of our trusty winter evergreens perhaps) . There is still a large silver birch and another Prunus very close by, so plenty of height and interest and perching places for the birds. On the other side of this garden we have decided to plant some more Peonies, another tough and easy plant that the rabbits find unpalatable. 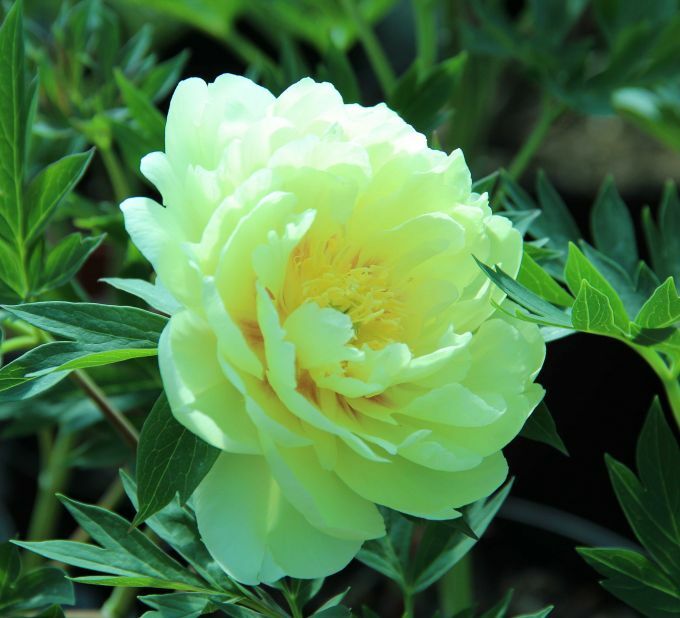 I have chosen an intersectional hybrid peony, called ‘Bartzella’, which we are hoping will give us gorgeous yellow flowers in a couple of years. Intersectional peonies are a cross between the larger woody tree peonies, like the pink one we have already in the Cullen garden, and the smaller herbaceous peonies that die back to the ground over winter. The intersectional types, first developed in the 1940’s, are said to have the advantages of both types. 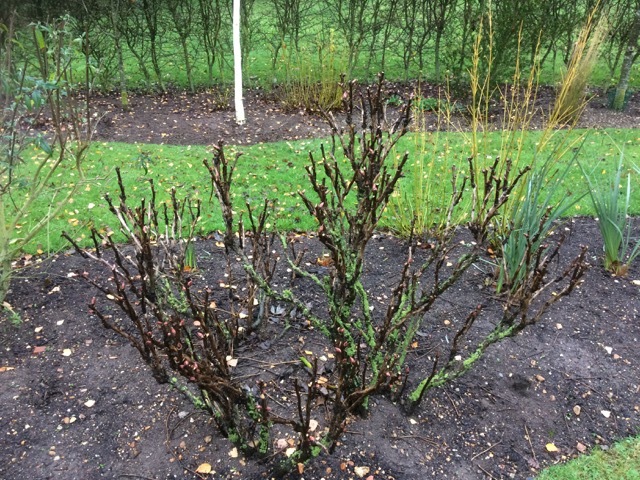 They have the sumptuous flowers and attractive leaves of a tree peony but the leaves die down in winter so you don’t have something looking like this all through the gloomy months. Also, the flowers don’t need staking and the leaves persist much longer than the herbaceous types. I must admit they are new to me, a red rag to a bull for us gardeners, so it will be interesting to see whether they live up to their reputation. Knowing my luck they will be the only peonies tasty to our rabbits! The Heritage Lottery project is progressing very well, with more interviews being added to those already done and our first glimpse of what the finished film might look like (make sure you take a look by clicking on the video link at the top of this page to see a teaser). 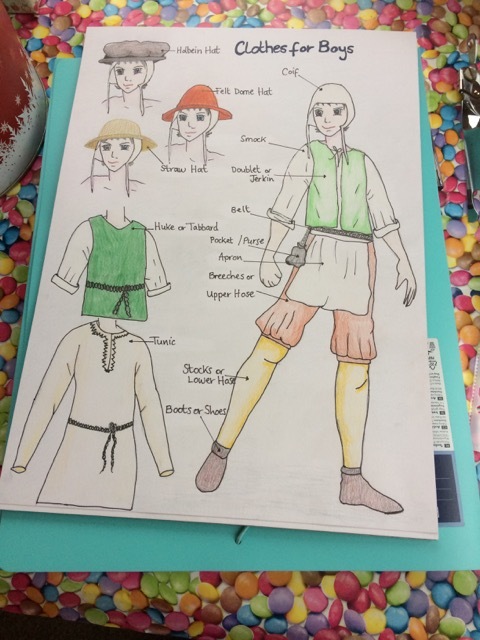 We are hard at work developing new ideas for garden interpretation and hope to revamp of the wellhouse to house a set of Tudor costumes for our younger visitors to try on in a spirit of getting to know what it was like in Tudor times. These costumes have been skillfully stitched by one of our multi-talented garden volunteers, mainly out of charity shop fabric, old sheets, blankets and mens’ shirts. A fantastic example of up-cycling. 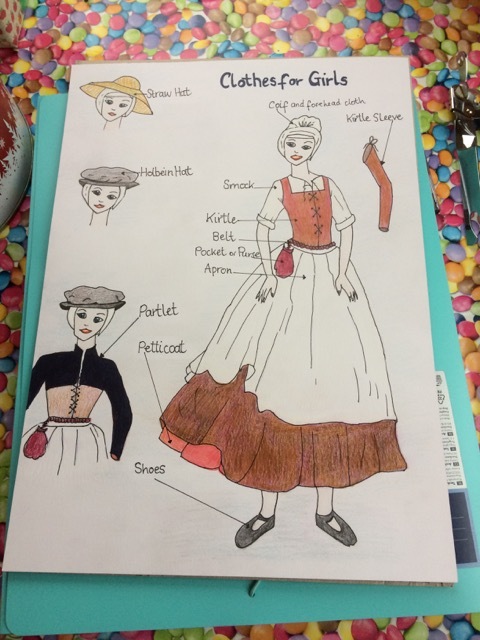 Visiting children will be able to choose from an array of aprons, jerkins, coifs and holbein hats and follow the instructions to dress like a Tudor. As we move into December it is comforting to know that all the tender container plants are tucked up for winter, moved to the greenhouse, shifted closer to the garden wall or placed under the gardeners’ shelter or simply wrapped up in situ to wait it out. This was the only option for the large pomegranate (Punica granatum) in the knot garden. It looks quite happy wrapped up in its oversized fleecy bag and is starting to feel festive! I think I will join it and open the first door on the advent calendar.